“GO FISH OIL 2,000mg Compact is an excellent source of Omega 3 Essential Fatty Acids which provide many well known health benefits. 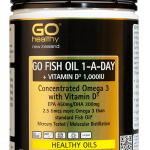 GO Fish Oil 2,000mg has been supplied in a compact capsule, which is half the size of some other 2,000mg Fish Oil products. This compact size makes it easy to swallow, convenient and consumer friendly. May be helpful in supporting the Recovery phase with a view to support inflammatory modulation. Use in the resilience and performance phases with individuals who may have limited dietary intake of healthy fats.